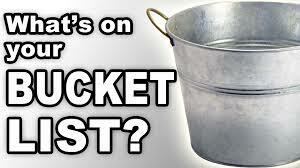 BNI of the Heartland: WHAT IS ON YOUR BUCKET LIST? Recently, my son and I watched “The Bucket List”, starring Morgan Freeman and Jack Nicholson. Like many movie watchers, this movie got my son and me thinking about our bucket lists. His list consisted of going to Wizardcom, meeting one of the doctors from Doctor Who and building a life-sized Lego fort. I thought about my own list. I had always wanted to see Wayne Dyer, but with his passing, unfortunately I’ll never get to check that off the list. I’m sure we all have a list of items like that—things we’ll never get to do because we missed the opportunity. One of my highlights this past year was to meet Ivan Misner. He has always impressed me with his books, blogs, articles and podcasts. I never had meeting him on my list, as I thought it would be impossible to meet him. Not only has BNI grown over the last thirty years, but one of its features that always amazes me is that it is duplicable. One of the things I enjoy about being part of BNI is seeing members’ businesses grow. Many will share how starting the business was always a dream for them. My daughter said she has two bucket lists. One list is what she’d do if she won the lottery and could do whatever she wanted with minimal limitations. Her other list is one with reasonable expectations. I’ll never see Wayne Dyer. I’ll probably never go to the moon. But I can visit my 95 year old Grandfather on a monthly basis and call him if I can’t make it to town. I can take my children to Canada to see a monty within the next five years. I can keep up with my out-of-state cousins on Facebook. Everyone can have a Bucket List with reasonable expectations. Even if it’s a small list, of meeting with BNI members for a 1 2 1. The best part about a reasonable expectations is that because you can actually accomplish the things on your list, you’ll feel great about being able to check the items off. If you have a spare moment, then log on to Successnet and start reading all the stories about members. After reading a few stories, you’ll feel good and start thinking if they can do it, then so can I. Another item on my bucket list is to purchase another rental property. I know some of you think that is crazy and how much work will be involved. My idea of another property is one in disrepair and needs a lot of work. But with my experience with BNI, I feel very confident that it will be a great adventure. With BNI members as my resource I can do anything. I know my trust with members will guide me to the right property and assist me from taking this property from the ugliest one on the block to one that will be a show stopper. After sharing my list with my son, he is excited to see a Monty. Now that he knows it’s a possibility, he’ll keep that list item on track. Make a list. Share it. The people in your corner will help make sure you reach your goals! Don’t miss an opportunity like I did, about seeing Wayne Dyer. Stop telling yourself you’ll get around to it. But also look around you or you might miss something that is right there.